Santa Rosa County is a county located in the U.S. state of Florida. As of the 2015 census, the population was 167,040. Its county seat is Milton. Santa Rosa County is included in the Pensacola-Ferry Pass-Brent, FL Metropolitan Statistical Area. Santa Rosa County was created in 1842. It was named for the Roman Catholic saint, Rosa de Viterbo. Santa Rosa County repealed its prohibition on alcohol in 2007. According to the U.S. Census Bureau, the county has a total area of 1,174 square miles (3,040 km2), of which 1,012 square miles (2,620 km2) is land and 162 square miles (420 km2) (13.8%) is water. Santa Rosa County can be divided into three distinct sections: South Santa Rosa, Central Santa Rosa, and North Santa Rosa. The sections are centered on the main east/west roads that pass through the county. South Santa Rosa County comprises the area from Holley and Navarre in the east to Gulf Breeze at the western end of the Gulf Breeze Peninsula (Fairpoint Peninsula), and along U.S. Highway 98. 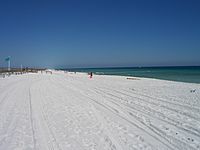 A section of Santa Rosa Island, containing the unincorporated community of Navarre Beach, is also part of South Santa Rosa County. Major bodies of water including Santa Rosa Sound, Pensacola Bay and East Bay strongly influence the housing and life style of citizens in the southern part of the county. This fast-growing region serves primarily as "bedroom communities" for Pensacola to the west and Hurlburt Field, Fort Walton Beach, and Eglin Air Force Base to the east. The U.S. Navy presence is marked by Whiting Field, NOLF Spencer Field and the former Ellyson Field. Central Santa Rosa County is the area north of the bays and south of the extensive forests separating it from North Santa Rosa. The central section developed along "The Old Spanish Trail" that ran from St. Augustine on the Atlantic Ocean all the way to New Orleans, and further points west. Today, U.S. Highway 90 closely parallels the old trail. The county seat, Milton is located where the trail crossed the Blackwater River. To the west of Milton, the fast-growing community of Pace have turned the west central part of the county into one large "bedroom community" for people who work in the industries here and in Escambia County, to the west. Interstate 10 also passes through this section of the county. State Road 87 traverses the county from north to south, between U.S. Highway 98 and the border with Escambia County, Alabama near Brewton, where it connects with State Route 41. This road is a primary emergency evacuation route for the county during hurricanes. As of the census of 2000, there were 117,743 people, 43,793 households, and 33,326 families residing in the county. The population density was 116 people per square mile (45/km²). There were 49,119 housing units at an average density of 48 per square mile (19/km²). The racial makeup of the county was 90.72% White, 4.25% Black or African American, 1.01% Native American, 1.30% Asian, 0.08% Pacific Islander, 0.67% from other races, and 1.98% from two or more races. 2.52% of the population were Hispanic or Latino of any race. There were 43,793 households out of which 36.50% had children under the age of 18 living with them, 62.20% were married couples living together, 10.20% had a female householder with no husband present, and 23.90% were non-families. 19.30% of all households were made up of individuals and 6.60% had someone living alone who was 65 years of age or older. The average household size was 2.63 and the average family size was 3.00. In the county, the population was spread out with 26.60% under the age of 18, 7.20% from 18 to 24, 31.10% from 25 to 44, 24.10% from 45 to 64, and 11.00% who were 65 years of age or older. The median age was 37 years. For every 100 females there were 100.60 males. For every 100 females age 18 and over, there were 97.90 males. The median income for a household in the county was $41,881, and the median income for a family was $46,929. Males had a median income of $34,878 versus $22,304 for females. The per capita income for the county was $20,089. About 7.90% of families and 9.80% of the population were below the poverty line, including 12.60% of those under age 18 and 7.50% of those age 65 or over. The Santa Rosa County Library System has 5 branches. 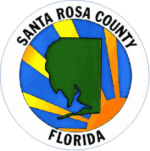 Santa Rosa County, Florida Facts for Kids. Kiddle Encyclopedia.